Packed with out-of-this-world action unlike anything you’ve ever seen, Valerian and the City of a Thousand Planets heads to 4K Ultra HD Combo Pack (plus Blu-ray and Digital HD), Blu-ray Combo Pack (plus DVD and Digital HD), and DVD November 21 from Lionsgate; and on Digital HD November 7 and On Demand November 21. Based on the best-selling French comic series “Valérian and Laureline” by Pierre Christin and Jean-Claude Mézières, published by Dargaud - visionary writer/director Luc Besson (The Fifth Element, Lucy) advances this iconic source material into a contemporary, unique and epic science fiction saga produced by Virginie Besson-Silla. Valerian and the City of a Thousand Planets stars Dane DeHaan (The Amazing Spider-Man 2), Cara Delevingne (Suicide Squad), Golden Globe® nominee Clive Owen (Children of Men), Academy Award® nominee Ethan Hawke (Best Supporting Actor, Boyhood, 2014), Golden Globe® & Emmy® winner John Goodman (voice) (“Rosanne”) with 7-time GRAMMY Award® winner Rihanna, and Golden Globe® winner Rutger Hauer (Bladerunner). 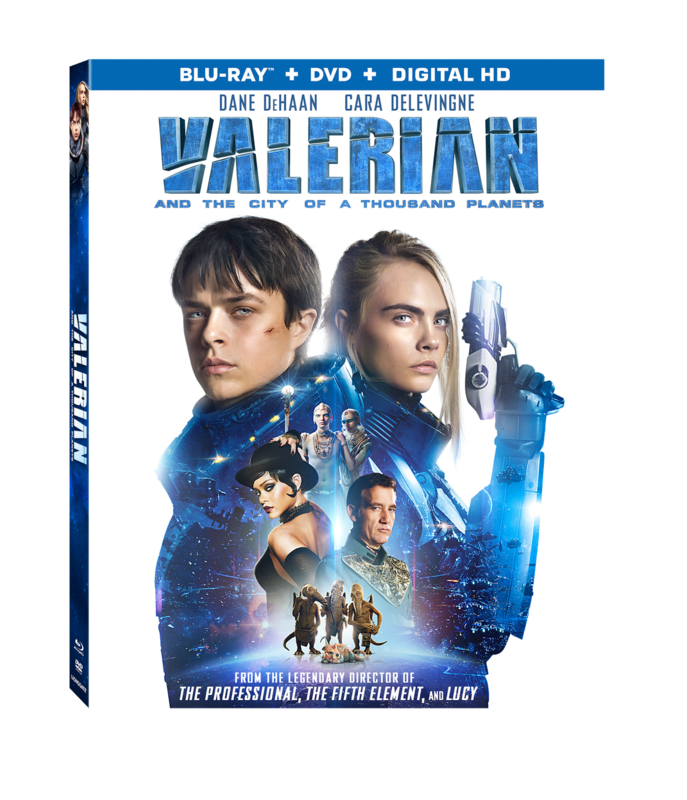 In the 28th century, Valerian (DeHaan) and Laureline (Delevingne) are a team of special operatives charged with maintaining order throughout the human territories. Under assignment from the Minister of Defense, the two embark on a mission to the astonishing city of Alpha—an ever-expanding metropolis where species from all over the universe have converged over centuries to share knowledge, intelligence, and cultures with each other. There is a mystery at the center of Alpha, a dark force which threatens the peaceful existence of the City of a Thousand Planets, and Valerian and Laureline must race to identify the marauding menace and safeguard not just Alpha, but the future of the universe. The Valerian and the City of a Thousand Planets home entertainment release features the five part documentary “Citizens of Imagination: Creating the Universe of Valerian” which delves into the creation of the characters in the film, including both humans and alien lifeforms, along with insight into the production design, special effects, and stunts. The home entertainment release also features a “The Art of Valerian” photo gallery, and Enhancement Pods. The 4K Ultra HD and Blu-ray versions feature Dolby Atmos® audio remixed specifically for the home-theater environment, to place and move audio anywhere in the room, including overhead. The 4K Ultra HD Blu-ray also features Dolby Vision™ high dynamic range (HDR), growing Lionsgate’s library of titles featuring both Dolby Vision and Dolby Atmos. Dolby Vision transforms the TV experience in the home by delivering greater brightness and contrast, as well as a fuller palette of rich colors. Together with the captivating sound of Dolby Atmos, consumers will experience both cutting-edge imaging and state-of-the-art sound technology for a fully immersive entertainment experience. Valerian and the City of a Thousand Planets will be available on 4K Ultra HD Combo Pack, Blu-ray Combo Pack, and DVD for the suggested retail price of $42.99, $39.99 and $29.95, respectively. Title Copyright: © 2017 Valerian SAS / TF1 Films Production. All Rights Reserved. Dolby Vision transforms your TV experience with dramatic imaging—incredible brightness, contrast, and color that bring entertainment to life before your eyes via OTT online streaming, Ultra HD Blu-ray, broadcast, and gaming applications. Dolby Atmos delivers moving audio — sound that can be precisely placed and moved anywhere in three-dimensional space, including overhead. It brings entertainment alive all around the audience in a powerfully immersive and emotive experience. EuropaCorp is one of Europe’s leading film studios. Founded in 1999, EuropaCorp has operations spanning production, theatrical distribution, video and VOD, and television sales. EuropaCorp also has international rights, partnerships and licensing, production and soundtrack publishing activities. The Group has also been producing TV series since 2010. EuropaCorp’s integrated business model allows it to benefit from diversified sources of revenue. With a line-up boasting various types of films and a very strong foothold in international markets, the Group has produced France’s biggest international hits in recent years. EuropaCorp was founded by French filmmaker, screenwriter and producer Luc Besson. The Group owns a catalogue of 500 movies. The first major new studio in decades, Lionsgate is a global content platform whose films, television series, digital products and linear and over-the-top platforms reach next-generation audiences around the world. In addition to its filmed entertainment leadership, Lionsgate content drives a growing presence in interactive and location-based entertainment, gaming, virtual reality and other new entertainment technologies. Lionsgate’s content initiatives are backed by a 16,000-title film and television library and delivered through a global licensing infrastructure. The Lionsgate brand is synonymous with original, daring and groundbreaking content created with special emphasis on the evolving patterns and diverse composition of the Company’s worldwide consumer base.